Group Al-Shabab is affiliated with al Qaeda, according to the U.S.
(CNN) -- Somalia's hard-line Islamic group Al-Shabab seized control of Jowhar, the president's hometown, after a battle with pro-government forces Sunday. 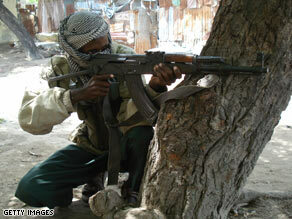 An Islamist fighter mans a position in the streets of Mogadishu, Somalia, on Saturday. Jowhar is a major town 55 miles (88 kilometers) southeast of Mogadishu, the capital. "All businesses are closed and residents are already fleeing while Al-Shabab are roaming the streets," a local journalist said. The town had been under the control of forces backing the transitional government, which is scrambling to cope with deadly advances from Al-Shabab in Mogadishu. Al-Shabab was once the armed wing of the Islamic Courts Union, which took over most of southern Somalia in the second half of 2006. The United States says the group is affiliated with the al Qaeda terrorist network, and the U.S. backed an Ethiopian invasion that drove the ICU from power in 2006. After seizing control of Jowhar on Sunday, the rebels started conducting "search operations in the police station and the provincial headquarters of the town," the journalist added. The clashes extended into the suburbs of the town, where sporadic fighting was going on between the rebels and government forces, said the journalist, who requested anonymity for safety reasons. The town's seizure comes amid escalating tension between Somalia's transitional government and the Al-Shabab militia, which has waged days-long attacks in the capital. In the latest round of violence, one person was killed and 15 others wounded when mortars slammed into a police academy in Mogadishu on Sunday. Clashes between the rebels and the government in Mogadishu have left at least 103 people dead and 420 wounded, Somali officials said Friday. The east African nation has not had an effective government since 1991. Last week, a spokesman for the rebel group said that it had successfully recruited more fighters. "It is not only Somali jihadists that are fighting in Mogadishu against the government," said Sheikh Hassan Ya'qub, a spokesman for Al-Shabab. "There are also foreign Muslim jihadist brothers who are fighting side by side with us." The new round of fighting stems from an interpretation of sharia, or Islamic law, the spokesman said. Somalia's new president, Sheikh Sharif Ahmed, recently approved implementing sharia, but the rebel group wants the country to institute a stricter form. Meanwhile, a powerful Islamist warlord defected to the government Saturday after he disagreed with rebel Islamist groups on the war against the transitional government. The warlord, Sheikh Yusuf Mohamud Siad Indha Ade, was the military commander of Hassan Dahir Aweys, who is suspected by the United States of being a terrorist.